As with any good competition, a proper kickoff is needed. This competition, however, unlike most, ends up giving us 2 clear winners and leaves us with no losers! This competition is between 2 All-Star performers, both brought to you via Maker’s Mark, and exclusively selected by the bourbon experts at Payless Liquor’s is their hand-picked 2016 Maker’s Mark Private Selection vs. 2017 Maker’s Mark Private Selection. To best understand the results, one must first understand the details that went into the construction of the two competitors. Maker’s Mark started their tradition of excellence in bourbon back in 1958. The Samuels’ family wanted to get into the bourbon-making business, but they wanted to offer something a bit different than the rest. In doing so they chose a wheated bourbon recipe, offering a softer and sweeter pallet them many of the rye-based bourbons of the time. Maker’s has made the same recipe without any variation (other than special higher proof options) until 2010 when Bill Samuels Jr. introduced Maker’s 46. This version of Maker’s kept the same family recipe so important to Bill but introduced a different aging process than anyone else in the industry by adding wooden staves to the barrels. 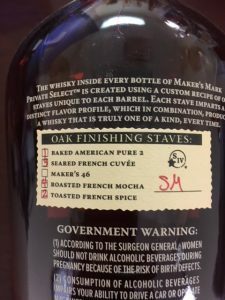 The genius behind adding the staves is that because there are no “unnatural” agents being added to achieve these flavors, it does not jeopardize its status as being a “true bourbon” by definition. In choosing French Oak staves, Bill was able to find just the right wood to amplify the baking spice flavors already existing in Maker’s bourbon. 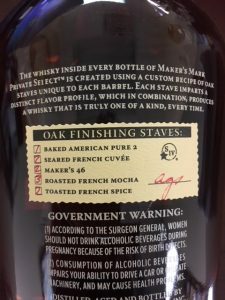 Ultimately, Bill settled on adding 10 French Oak staves Maker’s cask strength, aging them for an additional 9 week to achieve the desired taste profile. One drawback to choosing French Oak is that exposure to temperatures over 60 degrees draws out too much-unwanted flavors from the wood, limiting the making of this bourbon to the months of October through February. It is for this reason that Maker’s Mark is constructing a state-of-the-art underground aging facility to allow them to maintain a 50-degree average aging temperature, and also allow them to keep up with the ever-growing demand for these new expressions. 1) Maker’s 46 (French Oak): Spice, vanilla, dry finish, most balanced. 2) Seared French Cuvee: Caramel, butterscotch, nuttiness, slightly sweet, creamy finish. 3) Roasted French Mocha: Dark chocolate, coffee, soft char, growing sweetness, long dry finish. 4) Toasted French Spice: Fruit, complex spice, cinnamon, soft smoke, sharp finish. 5) Baked American Pure 2 (P2): Intense oak, vanilla, sweetened wood, sharp flavor. Now that we know what makes up the taste profile, let us look at the combinations of these 2 “competitors”. By looking at the combination of the staves, and what we know each brings to the profile, as you might conclude the 2016 is a softer, more subtle profile, while the 2017 selection brings more sharpness and spice to the party. Nose: Soft sweet caramel, hints of vanilla, roasted nuts, with subtle milk chocolate at the end. Taste: Chocolate jumps out front, sweetness exists but doesn’t overtake, soft baking spice, caramel enters late. Finish: Chocolate remains dominate, dark coffee enters, ushering in a lingering but dry finish to overtake at the end. Nose: Sweet wood, red fruit, with baking spices entering strongly at the end. Taste: Vanilla, hints of caramel, notes of sweetness follow before sharp oak and spice take over the mid pallet. Finish: Sweet wood, caramel apple, cinnamon,& dark chocolate joining more spice for a medium, slightly dry finish. While I very much enjoy both selections, my taste pallet takes me to the 2017 Private Selection. 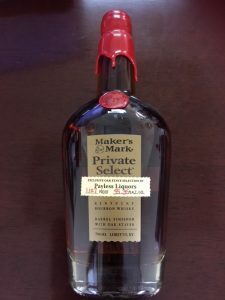 I can see the 2016 Private Selection being favored by newer bourbon drinkers or those who want a softer entry that the original Maker’s provides, while the 2017 selection being the choice of those who are fans of more spice that the Maker’s 46 offers. I summary I have a confession to make… I have become a HUGE fan of all the Maker’s Mark Private Selections! 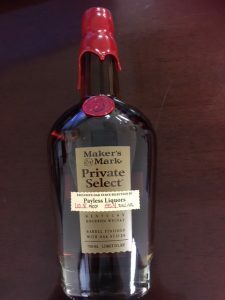 For someone who never had Maker’s on my bourbon radar until l recently, I have enjoyed more variances of Maker’s Mark Private Selections then any other bourbon line over the past year. (And the Payless options rule the roost of those selections!) I love the fact that I can track the combinations I enjoy, and because I know the consistency that Maker’s offers, I know I can find the flavor I desire again, unlike with other Single Barrel options that can never again be duplicated.